Though book stores and book clubs bill this as a memoir, it is really a collection of essays and speeches originally published for other purposes. Though I would love to read an actual autobiography written by Tan, this is an excellent anthology, and I cannot deny it the five stars it deserves. Tan writes about a wide range of experiences, from contracting Lyme disease to writing the screen play of The Joy Luck Club for Disney. It was nice to see somebody say something positive about Disney for once. But if there is one really urgent entreaty nestled amongst the wide variety of topics addressed here, it is this: Tan would like to be released from her pigeon hole. 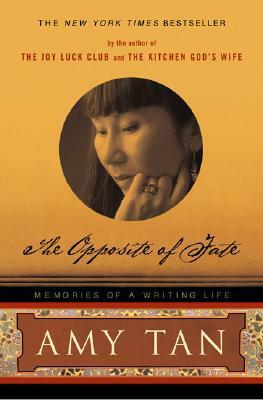 Though the large number of her books sold is both profitable and gratifying, she feels both awkward and a trifle outraged as well at having been labeled by the press, by school districts who require that her stories be read, and by any number of other sources as an Asian-American writer, or a writer of color. What, she asks, is required just to be called an American writer? She was born in the USA. It’s accurate to say that she has written a lot of stories, both fictional and true, about her mother, who was born in China. But Tan takes exception to being held up as the one person who is supposed to represent all Asian-American writers. One might imagine other Asian American writers would take even greater exception, if they could be heard. I confess that I am at least partially among the guilty, having created an Asian studies label on my own bookshelves. Actually, since I am married to a Japanese citizen, the titles written by and about Asian Americans are crowded by vastly more titles written in Japanese, which take a number of bookcases all by themselves. This is not something that happens in most American homes. But yes, I have also regarded Tan as an Asian-American writer, and she is right in saying that regardless of pigmentation or ethnic background, her prose has won her a place on our shelves. Marketing be damned. I reflected a bit here. My youngest daughter is half Japanese, half Caucasian. We named her for her Japanese grandmother, and we started attempting to teach her Japanese when she was quite young. She has been to Japan and met relatives there. Yet she would rather be regarded as an American rather than an Asian-American. She pointed out to me that my own side of her counts too; does anyone call her an Irish-American because one parent is of Irish descent? The score stands at parents 0, offspring 1. But Tan also reminds us that our lives are not about what has happened to us—and she certainly does a fine job of recounting her own varied, sometimes bizarre experiences—but about whether we take charge of them. In the final essay, “The Opposite of Fate”, she contracts Lime disease and it continues to ravage her health and interfere with her writing until she does a comprehensive web-crawl and diagnoses it herself. Leaving the mystery for physicians to unravel hasn’t helped, and so she does what needs doing. That having been done, the official, medical diagnosis and treatment are fairly straight-forward. The cure isn’t easy or quick, but progress is made steadily. She took ownership of her problem, advocated for herself, and received treatment. Though the message inherent in the title seems obvious, I find it powerful. Most of us know someone—perhaps even in the family—who seems to ride through life helpless and riddled with excuses for everything. There is nothing for these folks that can’t wait another day, and sometimes another and yet another. They don’t “do” things; things “happen”. I confess it makes me crazy. Thus I found Tan’s essays keenly satisfying. She tells hilarious stories sometimes, while others are poignant, but all of them involve decisions at some level, though not always up front and pointed. She doesn’t preach, but she also doesn’t duck and cover. When life presents challenges, she rises to meet them. One could, of course, say that in publishing these stories, she has created a powerful example for Asian-American girls. But one really shouldn’t. Because the fact is, she has presented a strong, positive example for everybody.